So, here goes. 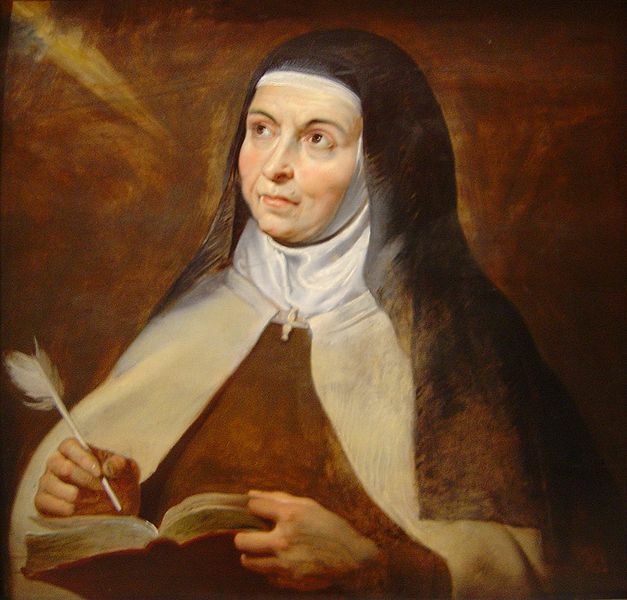 I am SUCH a huge groupie of this AMAZING woman of faith who lived a long time ago – (1515-1582) – but who continues to be used of God to impact so many folks today through her writings and life of dynamic faith, dedicated courage & PASSIONATE love of Jesus Christ. She so loved Jesus – crazily putting all her trust in Him during tense times of the Inquisition (no fun at all, at all), writing when she was under difficult scrutiny (one confessor priest consulted a huge stack of deep theological books “to try to understand an hour with Teresa!”), continuing to push for reform of her contemplative order when so many challenges and challenging people stood against her. 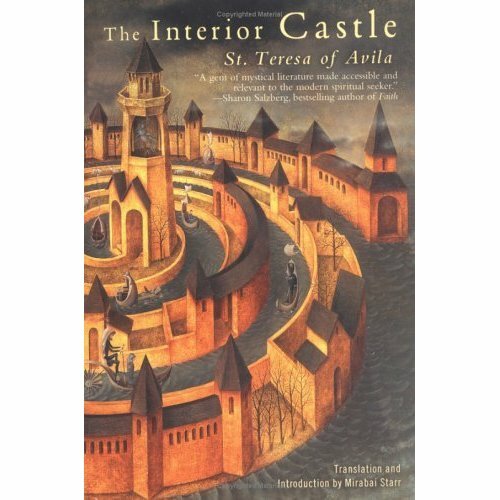 In my early 20s I read St. Teresa of Avila’s books, “The Interior Castle” and “My Life” – resulting in lots of faith strengthening & deepening. Teresa’s images of long ago are still relevant today as she likens our faith journey to the structure of a castle as we enter into each part (dealing with the tough stuff along the way..) Her “Way of Perfection” is also excellent…and anything else you can set your eyes upon! Her words have a way of jumping off the page & zapping your heart — gradually edging their way through those difficult mind doors… to get that change thing going. This entry was posted in Bookshelf (BOOKS), Sunday-ish Reflections and tagged Interior Castle, st. teresa of avila, women of faith. Bookmark the permalink. Happy St. Teresa’s Day to you too, from your fellow St. Teresa fan. I love her too – she was brilliant, intense, passionate, and had a backbone of steel. After the bishop blessed one of her monasteries, he knelt down and asked her to bless him! Almost blasphemous! But he recognized the full embodiment of Christ in her soul. Smart man. You are right. Her writing is ageless. She complained in her diary that it was annoying how men thought that she was unable to teach or spiritually direct because she was a woman. But she knew that God didn’t feel that way. She was able to separate ignorant church beliefs from God’s truth. She had an intimate relationship with God and knew that she was called to teach, write and direct no matter how much trouble it got her into. And here we are in 2012 with churches still teaching that women should be forbidden to teach men. The ignorance continues….but the wisdom of St. Teresa is there too.